DEOS – Energos Polska Co. Ltd. The DEOS series is developed for the sludge treatment process where the conventional mechanical dewatering machine are already installed and operated. The DEOS series is the secondary dewatering solution that can reduce the volume of the sludge produced by the conventional mechanical dewatering machines such as belt press, centrifuge and screw press. The DEOS series can be installed simply just after the existing mechanical dewatering machines process. The sludge is to be transferred to the DEOS series after dewatering by the existing machines, then, combined dewatering process of the mechanical and the electrokinetic dewatering of the DEOS series easily reduces the volume of the sludge more about 50% by achieving the dry solid of 35-40%. The original and unique structure of the electrokinetic zone with only one filter cloth enables more dryness of the sludge and less energy consumption. By adding DEOS series on the existing dewatering units, the client can get more dry solid which can reduce the disposal cost and apply to reuse and recycle for the further treatment. The E series can be effectively applied for the thermal drying process in order to save the thermal drying cost and investment. The DEOS series convinces through its high performance in dewatering, throughput and low energy consumption. The intensified environmental regulations and increasing sludge disposal costs exert significant economic pressure in the industry. Due to the limited dewatering levels of 25% or less by the belt press, centrifuge, and other mechanical dewatering technologies, the need for an efficient, complementary dewatering solution has been greater than ever. The electrokinetic dewatering technology is the very solution can go beyond than conventional mechanical technologies. The high energy efficiency solution also replaces or retrofits the thermal treatment process. The thermal treatment is the only method that can reach 90% of dry solid for the further treatment. The electrokinetic dewatering can save the capital cost for the dryers, incinerators as well as the operational cost. The electrokinetic dewatering also has a direct impact on the quality of the sludge. Applying an electrical current to residuals removes the odor of the cake by evaporating hydrogen sulfide. The combination of electricity, heat and pressure also has a positive impact on disinfection, practically eliminating pathogens such as E.coli, salmonella, enteric viruses and parasites. The electrokinetic-treated sludge can meet the Class A standard of US EPA. The sludge can be a valuable resource of reuse, recycling and the fuel when the moist and pathogens are properly treated and removes. The sludge as a new resource of renewable energy is the better scenario of the future treatment. The electrokinetic dewatering is an advanced dewatering technology that extracts free water, external and internal water from the sludge at the molecular level. The most effective electrokinetic dewatering can be achieved by combining the electrokinetic phenomena of electrophoresis, electroosmosis, and associated electrokinetic functions such as electrolysis with the traditional functions of thickening, filtration and pressure. The electrokinetic dewatering can achieve 35-40% of dry solid by taking out the free water, external water, internal water and part of bonded water, whereas the conventional dewatering can achieve only 20-25% dry solid by taking out only free water and external water. This distribution takes the following forms : (a) free moisture that is not attached to the sludge particles and can be removed by gravitational settling (b) interstitial moisture that is trapped within the flocs of solids or exists in the capillaries of the dewatered cake and can be removed by strong mechanical forces (c) surface moisture that is held on the surface of the solid particles by adsorption and adhesion and (d) intracellular and chemically bound moisture. The amount of water that can be removed depends on the dewatering process and also the status of the water in the sludge. 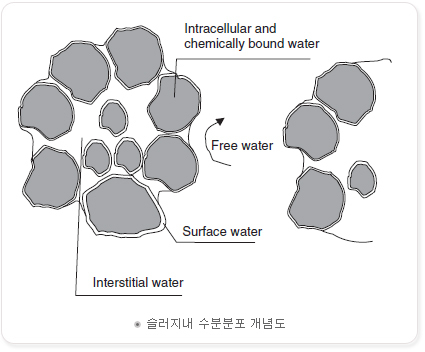 The water that can be removed by mechanical dewatering is usually termed as ‘‘free water” and the remaining as ‘‘bound water.” The bound water content is the theoretical limit of mechanical dewatering. The free water so defined includes truly the free, interstitial, and partially the surface moisture. The bound water includes the chemically bound moisture and partially the surface moisture. Electrophoresis is the motion of dispersed particles relative to a fluid under the influence of a spatially uniform electric field. This electro kinetic phenomenon was observed for the first time in 1807 by F.F. Reuss. Electro-osmosis, also called electroendosmosis, is the motion of polar liquid through a membrane or other porous structure (generally, along charged surfaces of any shape and also through non-macro porous materials which have ionic sites and allow for water uptake, the latter sometimes referred to as ‘chemical porosity’’) under the influence of an applied electric field. Electro-osmosis was first described in 1809 by F.F. Reuss. Device to assist dewatering sludge, electro-osmosis dehydration method is based on new technology enables high-dehydration by separating water molecules from the sludge via the mechanism of electrophoresis, the essence of which is to allocate a mixture of water and sludge movement through appropriately targeted molecules in the electric field. Unlike conventional methods of dewatering using pressure-assisted chemical technology, this device uses the phenomenon of the flow of electric charge between the electrodes. Applying voltage to the electrode bring about the movement of sludge particles – electrophoresis – towards the anode (+), then the movement of water molecules ? 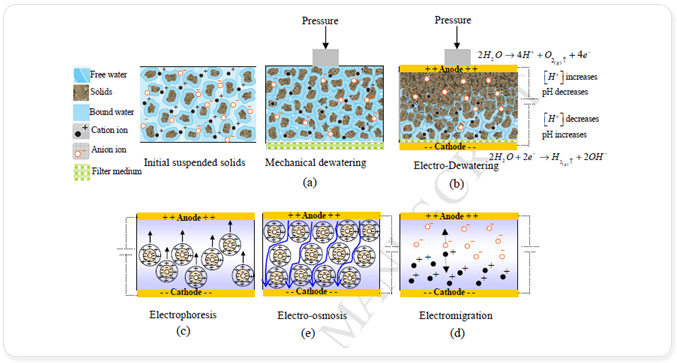 electro-osmosis – towards a cathode (-). In this way, high-dewatered sludge can be obtained by eliminating the water in the sludge at maximum level.